This mid-19th century, coral-stone house was renovated in the 1970s, becoming La Bonne Auberge, a ﬁne dining restaurant whose owners lived upstairs. Updated again in the 1980s, it is now a family home again. It stands in over 2 acres of beautiful grounds and boasts one of the grandest staircases on the island. 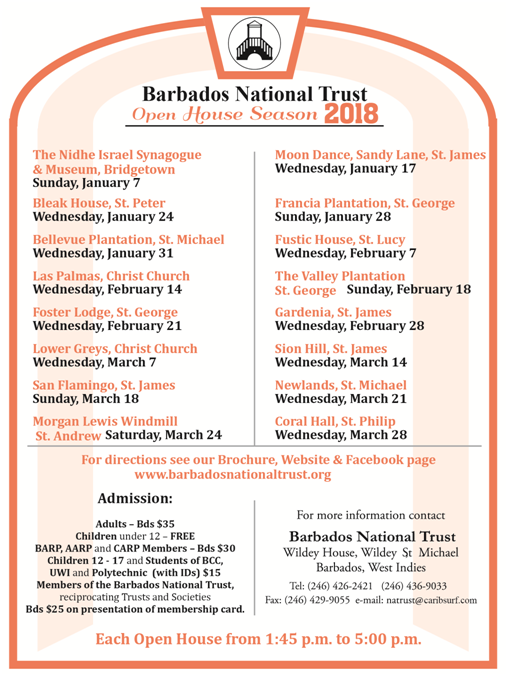 The Barbados National Trust Open House Season, which has been a 'must do' on Barbados' events calendar since the 1960s, continues in 2018 with a showcase of some of Barbados' most historically interesting and architecturally magnificent private homes. In addition to 'lively talks', narrated by some of Barbados’ most well-known historians and architectural aficionados, the Open House Season 2018 will also feature live music, cultural performances by local schools, beautiful handmade Barbadian craft sold by artisans and many more enjoyable surprises!